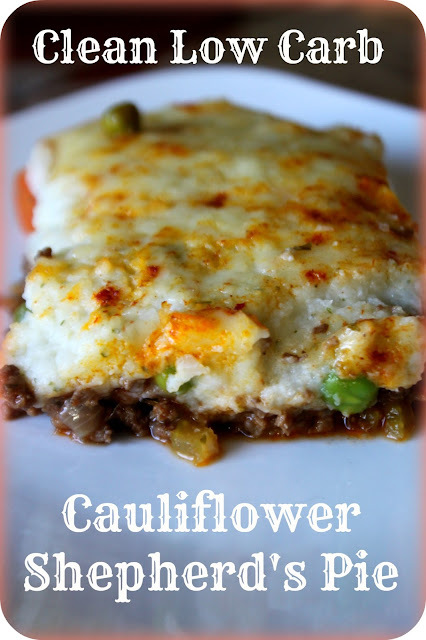 This is a great all-in-one meal that has no wheat, no white potato's and lots of flavor. I'll have to admit this recipe is a bit involved. It might be something you want to make the night before and assemble the day you are serving or save it for a weekend meal when you have some time to cook. Next time I will be doing a double batch and freezing one for another meal. I will be making this again because it was AWESOME. I loved it, hubby loved it and my 5 year old liked it. Win. If you are wondering why I don't eat white potatoes anymore its because they are starchy and high in carbohydrates. I avoid the carbohydrate roller coaster at all costs because of my ridiculous blood sugar swings. Cauliflower only has a fraction of the carbs and calories of white potatoes so it is a great substitute if you have blood sugar problems like me or if you are trying to lose weight. I actually added a fair amount of butter and oil to my recipe because I need the calories but you could cut that back if you are counting. On an unrelated matter, we had some spring flooding in our basement last night. Unusual since its was still in the minus 20 degree Celsius range last night and it hasn't started melted. Actually not so unusual when you have a 3 and 5 year-old who plug up the bathroom sink with Kleenex, turn the faucet full blast and decide to "build a skating rink" in the basement. Yep - they got a little crazy with their playing last night. They apparently forgot about it after they got in trouble about another matter on the main floor and went upstairs for their bath. I discovered it about 3 hours later...........3 hours of water gushing over the floor. Thankfully they were sleeping when it was discovered (or I might have lost my mind). Its a huge mess, a few things will be thrown out, but we don't think too much costly damage was done. Place cauliflower in a large pot covered with water. Bring to a boil. Reduce to a gentle boil and cook with lid on for 8 - 10 minutes. Cauliflower should be tender but not mushy. Remove from heat. Drain well. Put the cauliflower back in pot with lid on and let stand for 5 minutes. This ensures the cauliflower doesn't get watery. Don't skip this step. Place cooked cauliflower in the food processor with butter and spices. Pulse until it becomes whipped/consistency of mashed potatoes (you might want to do it in two batches depending on your food processor size). Instead of butter I have also used plain Greek Yogurt or cream cheese - its pretty versatile so use what you've got. Set aside. Brown the ground beef over medium heat. In a separate pan, fry the oil, garlic, onion and carrots over medium heat until softened. About 3 -5 minutes. Add celery and mushrooms and cook for one additional minute. Add browned ground beef, salt, Worcestershire, broth, soy sauce, tomato paste and parsley to the mixture. Simmer over medium heat for about 15 minutes until cooked through and some of the juice has cooked off (so its not runny). Add frozen peas in for the last 10 minutes or so. I didn't need to thicken mine but if your beef was not lean you may have to thicken with guar gum or another thickener or continue simmering until thickened to your liking. Preheat the oven to 350 degrees. Spread the beef mixture into a 9 x 13 casserole dish. Top with mashed cauliflower. I dolloped it out evenly over the top and then smoothed it down with the back of a spoon to evenly distribute it over the top. Sprinkle with Mozzarella cheese, Parmesan cheese and a dash of Paprika. Bake in the oven for 45 minutes until bubbling and cheese is cooked. Broil cheese for a couple of minutes if it doesn't crisp up - it will depend on the type of cheese you use. Let stand for 5 - 10 minutes before slicing and serving. Clean and Low-Carb Twice Baked Mashed Cauliflower with bacon and cheese (serves 3 - 4) recipe. Its a bit of an involved recipe so a good idea is to just make a double batch of mashed cauliflower one day - use half for as a side for dinner that night and use the other half to make this on the second day. Or double the recipe and freeze one for another day! Details Supports Low-Carb Lifestyle. Supports Weight Loss. Clinically Tested. You can still enjoy the foods you love! As the. Hi, just a quick question! At what point would I freeze the recipe? Its just me and my housemate, so I was going to make 2 two people portions and freeze one? Would this work and if so how long would it take to cook then? You could either assemble it and freeze or just bake, cool and then freeze it. If you split it into smaller pans you could probably just reduce the cooking by 5 minutes or so. Good luck and let me know if it turns out. I made this tonight and it was DELICIOUS!! My three kids and I have started clean/low-carb eating and it's so nice to have some of our favorite foods and leave the table with no regrets or stomachaches! I will be sharing this!!! So glad you enjoyed it! We ended up giving up dairy but I still make it with non-dairy cheese and nutritional yeast and its still one of my favorite recipes. This looks incredible! I really want to try this, but I'm on induction and I have to be careful with my carb intake. I was wondering what the carb count is per serving. Sorry - I don't keep track of calories/carbs but if you look though the comments I think some others have calculated it and its quite low. Do you know about how many carbs there are in a serving? It looks delicious! I entered this into spark people recipe calculator without the peas or carrots and it shows a net carb count of 6 carbs when divided into 4 servings. I omitted those as my husband will not eat that. Thanks for checking into that. Definitely a low carb option. 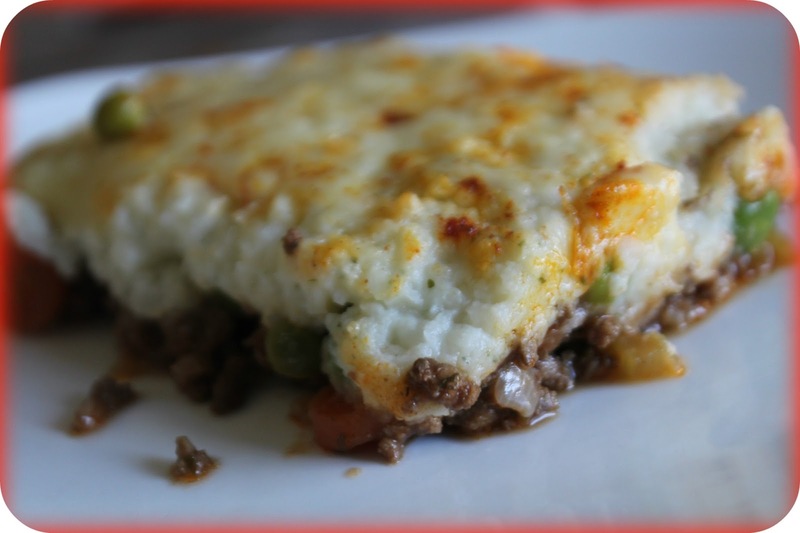 Where I come from the beef version of this dish is known as cottage pie, only the lamb version can be called shepherd's pie. Unsure whether there is a pork version but that sounds delicious. Either way, I'll be trying this--it looks great! Very interesting Dom! Hope you ended up trying it - whatever its proper name is! My MIL makes with venison. It is awesome! Just made this tonight for dinner and it's amazing!!! Thanks for a wonderful recipe! I will definitely be making it again. So glad you enjoyed it. This is a pretty full-proof recipe that everyone seems to love. Oh my goodness, this is good! I omitted the celery, mushrooms, soy sauce, and mozzarella but added leftover cooked veggies (spinach, chard, kale, bell pepper, brocollini, and roasted garlic). It's delicious! I made mine with lentils instead of beef - yum! You can throw in any leftover veggies and it comes out great. Really not that difficult to make. Ready to go in the oven as I type..,.,.hubby should be calling on the way home anytime now. Used leftover orgainic beef (extra lean too),, I'm sure its going to be so good!! Was great. DH loved it! It is the option of anybody whom you may be following to grant authorization to followers, so that you can comment and like on the remarks created by them. It completely depends on the person. My daughter made this for the family tonight and everyone LOVED it. Delicious!!! Do you know the nutrition facts for this meal? buy facebook 5 star reviews Lifetime Replacement is something which you hardly find, while you Buy facebook reviews. Only a handful of good agencies provide this. How Long ahead can you assemble without cooking and put into the refrigerator instead of freezing? For example today is Tuesday I have an event on Sunday but am very busy on Sat. So i was thinking of making it Tuesday or Wednesday and put it in refrig. to cook on Sunday Morning.